So you’ve sipped all the water from your coconut, what do you do with the rest of it? If the coconut is young, the flesh should be soft, jelly-like and almost transparent, easy to scoop out with a spoon to eat fresh off the husk. Mature coconuts have whiter, thicker and tougher flesh that you’ll be able to use in more ways. Find an inexpensive hand-held coconut flesh scraper or pulverize the chunks in a blender. Some local markets have coconut grating machine to get it all out in seconds. Sprinkle the shavings on your salad, soup, ice-cream or any kind of desert. Bake some coconut muffins or incorporate into your brownies. Store in an airtight freezer bag to last up to 3 days. Use the shavings to make coconut milk. In a metal or glass container, pour about the same amount of boiling water into the fresh coconut shavings and leave for 15 minutes. Pour the mixture through a cheese cloth or fine strainer and into a pitcher. Use coconut milk as an ingredient for dairy-free deserts or freeze into ice-cube trays and blend with smoothies for a creamier taste. Eat it along with your cereals, fruits and muesli. To deep condition your hair, leave on for 10 minutes before rinsing off. Can be stored in your refrigerator for up to 3 days. The process depends on the day’s temperature. If it’s warm, place the coconut milk in a pitcher and leave in the refrigerator for 30 to 45 minutes. For places with colder climates, you should be able to just let it sit and see the results in the same amount of time. A thin layer of white cream should form on top. Scrape it off with a spoon and place in an airtight glass jar for storage. The chunks will melt into coconut oil in room temperature. Cold-pressed coconut oil is safe to ingest so use it to fry food or as a salad oil. Drink 1-2 tablespoons a day for better health. For oil pulling, swish around your mouth and gargle for at least 5 minutes. Place the coconut milk in a metal pan and bring up to a slow simmer. The heat will cause the oils to separate from the mixture. Scoop the oil out of the pan and transfer into a glass bottle. You’ll be able to get more oil from this heat induced method. The golden brown fragrant product is perfect as massage or tanning oil. Massage into your scalp and leave on for 10 minutes overnight for a healthier scalp and shiner hair. Polish wooden furniture and floors with a few drops of the oil. Our Raw Vegan Fudge uses coconut oil. Save the wet pressed shavings to make your very own coconut flour. With a fork, distribute the clumps evenly on a baking sheet. Leave out to dry for 24 hours. If you’re in a bit of a rush, leave in the oven with the oven light on, dehydrate or bake at the lowest setting before it changes color. When the coconut flakes have dried out, transfer into a blender and enjoy! Taste Blue Osa’s Gluten Free Coconut Cookies. Save the pressed shavings and bring them with you the next time you shower. Scrub all over your body for an exfoliating and revitalizing effect. So far, this is the best gentle body scrub I’ve ever tried! 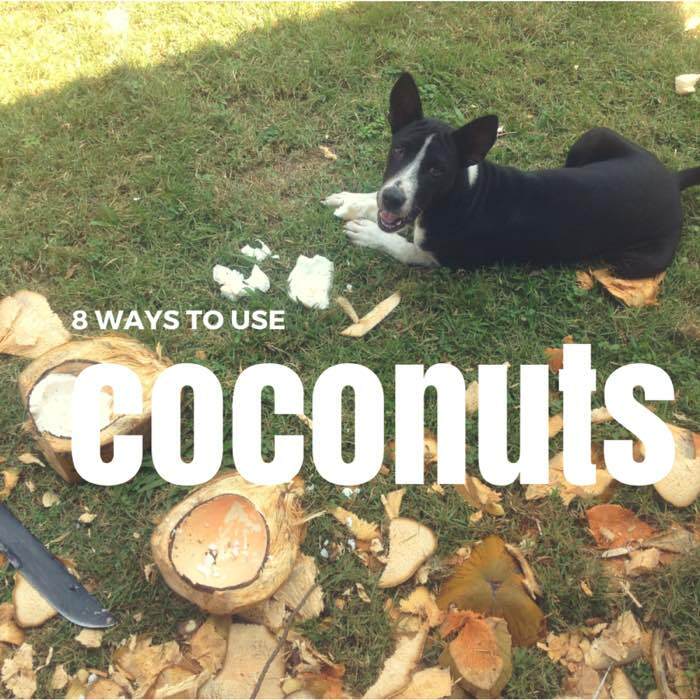 Throw the used pressed coconut shavings into a compost to make the best organic fertilizer. If your coconut still has the husk on it, you can make an Asian style bunot to polish wooden floors beautifully. Drop some coconut oil or floor wax onto the wooden floor and using one foot, polish away! Adi is a thirty-something Filipina yogini and wanderer at heart. She escaped the ruthless corporate world in Manila, then sold and gave away most of her possessions when she moved to a tiny surf island in Indonesia. She rock climbed all over Southeast Asia before taking the big leap to Latin America. She draws colourful mandalas when she needs a break from social media. Her biggest weakness has always been bacon. She is currently falling in love and volunteering her way throughout Costa Rica. Thanks a lot very much for your high quality and amazing help!